Students can register now for the Sierra College Construction and Energy Technology program in Rocklin CA that teaches practical skills with hands-on projects and industry field trips such as touring California ISO, has one of the highest pass rates in the country for the North American Board of Certified Energy Practitioners (NABCEP) Entry Level exam, and offers certificates or degrees in Residential Building Construction and Construction Management, and Photovoltaic Advanced Skills Certificates. Sierra College CET students toured the control room at California ISO in Folsom and learned about energy careers. Photo courtesy of California ISO. We look for critical thinking skills, level heading processing, excellent communication skills and the ability to lead people. Sierra College Construction & Energy Technology (CET) instructor, Steve Geiger, had a dual purpose for taking his Energy Efficient Construction Class on a field trip to California ISO in Folsom. Not only did the students learn about how California ISO manages electricity flow throughout the state, they got to see an excellent example of a LEED Platinum Certified Building. California ISO is nonprofit public benefit corporation that balances electricity supply and demand by managing the flow of electricity across high-voltage, long-distance power lines that make up 80 percent of California’s transmission grid. Field trips are an essential part of the hands-on program at Sierra College in Rocklin, CA explained Geiger. 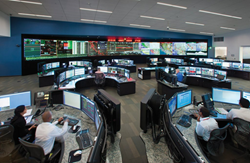 “Looking down into the control room showed the students the big picture of energy use in California,” said Geiger. “They became more aware of the broad range of careers that are energy related.” The Sierra College Construction and Energy Technology program offers certificates or degrees in Residential Building Construction or Construction Management, or Photovoltaic Advanced Skills Certificates. Sierra College recently announced that students can apply now for summer and fall semesters. Klauer explained that operations staff must be able to think on their feet, react calmly and follow procedures. “We look for critical thinking skills, level heading processing, excellent communication skills and the ability to lead people through a series of operations,” said Klauer. He mentioned that there are also career opportunities in technology for those who can interpret and analyze data as well as for electrical and systems engineers. The students were excited to see how environmental stewardship impacted the design, architecture, materials, equipment choices and construction methods. “It takes excellent project management skills to manage a construction project of this magnitude,” said Cloney. Students who think they’d enjoy learning through practical hands-on solar and construction projects and industry field trips can find out about Sierra College CET classes, certification, degrees or CSU Transfer at the Sierra College solar and construction webpages. Sierra College also has one of the highest pass rates (90th percentile) in the country over five years for the North American Board of Certified Energy Practitioners (NABCEP) Entry Level exam recognized nationally by the solar industry. After completing CET 40 - Beginning Photovoltaic Systems and CET 42 - Intermediate Photovoltaic Systems, Sierra College students are prepared to take the NABCEP exam. Students can earn a Photovoltaic Advanced Skills Certificate after completing these courses plus CET 44 - Advanced Photovoltaic Systems. Learn more about Sierra College CET by contacting Steve Geiger at (916) 660-7843 or sgeiger(at)sierracollege.edu, and going to the Sierra College Construction and Energy Technology websites. Sierra College District is celebrating its 80th Anniversary in 2016, and the Nevada County Campus in Grass Valley is celebrating 20 years. Sierra College serves 3200 square miles of Northern CA with campuses in Roseville, Rocklin, Grass Valley, and Truckee. With approximately 125 degree and certificate programs, Sierra College is ranked first in Northern California (Sacramento north) for transfers to four year Universities, offers career/technical training, and classes for upgrading job skills. Sierra graduates can be found in businesses and industries throughout the region.